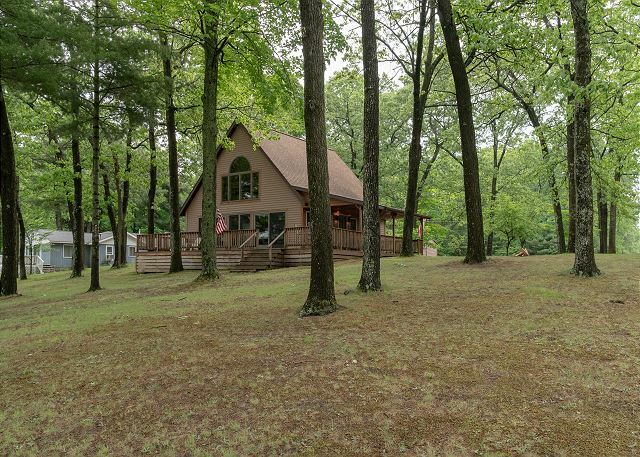 Beautiful, wooded lot with huge deck, large yard, private deck and lake frontage. Large open and bright dining area with views to the large deck and out to Long Lake. 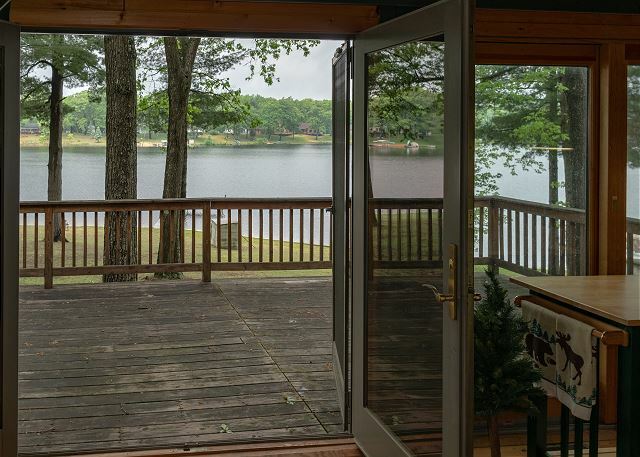 Large sliders with access and views to the large wrap around deck and private lake frontage and dock. Main floor bedroom # 2 with queen bed. 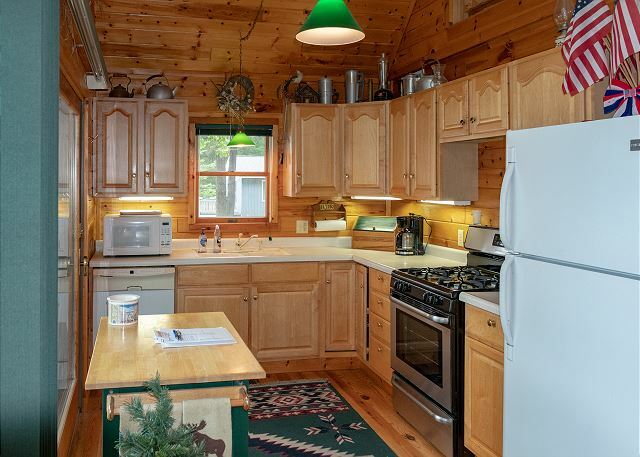 Well stocked kitchen with all major appliances and everything you'll need to prepare meals. Full main floor bathroom with stand up shower. Large open living and dining area with great views of Long Lake. 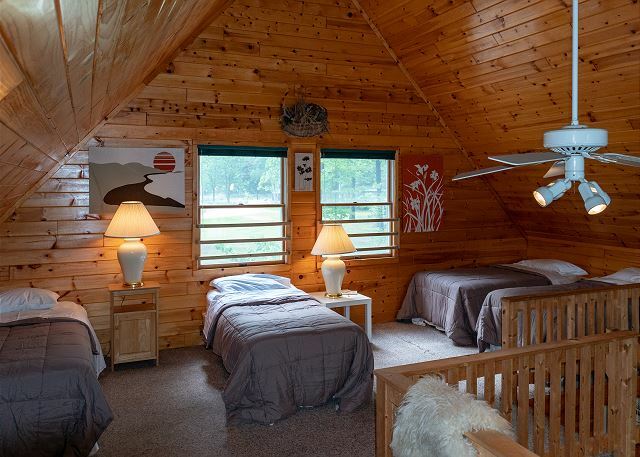 Upper loft area with 4 twin beds and great views of the lake! Large loft area with sleeping for up to 4 people. Great views of Long Lake from the loft area. Living area with stairs up to the loft sleeping area. View from upper loft area down to the living room and dining room areas. French doors with access to the large wrap around deck. Large wrap around deck with dining set and seating, all over looking the large yard, the private dock and the private frontage on Long Lake. 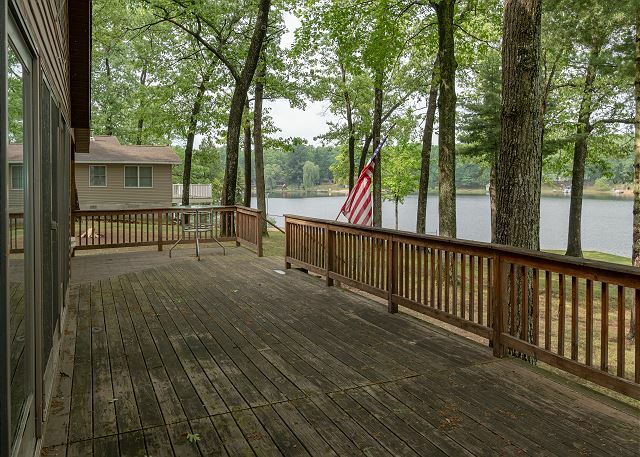 Expansive deck with great views of Long Lake. 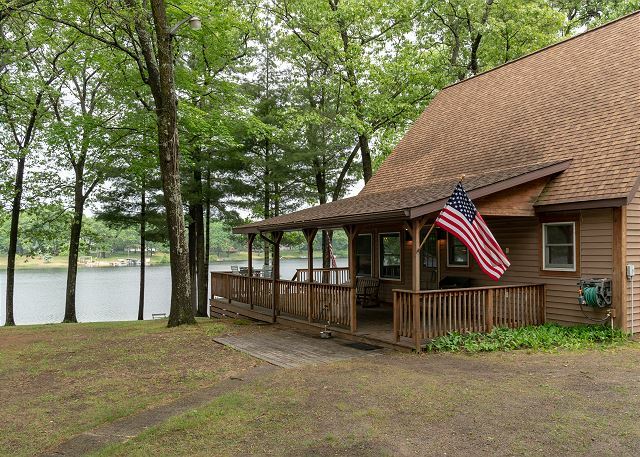 Classic and well kept cabin overlooking Long Lake. 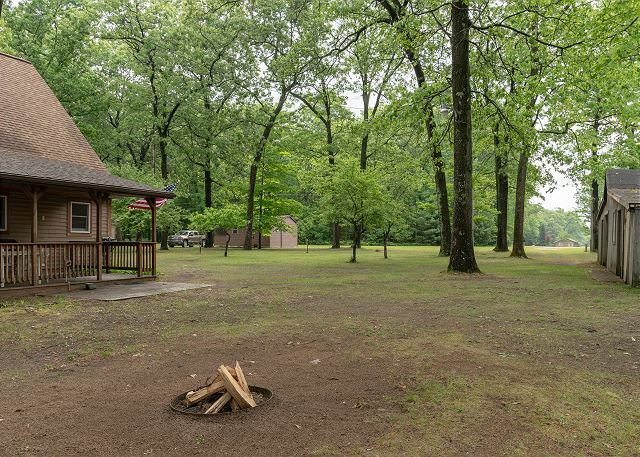 Plenty of room to move around, park, play games on this huge lakeside lot. View of the cottage from the lake side. Bring your boat and tie it up for your whole stay! 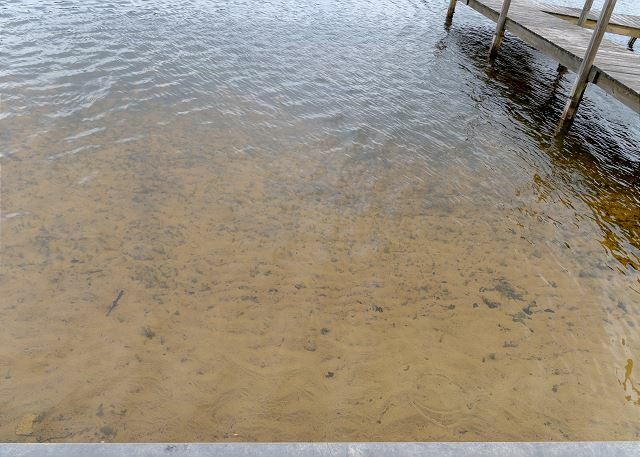 Sandy shoreline allows for kid friendly access and is great for swimming! Large back yard with mature trees and amazing views. Looking back towards the cottage from the private dock and shoreline. 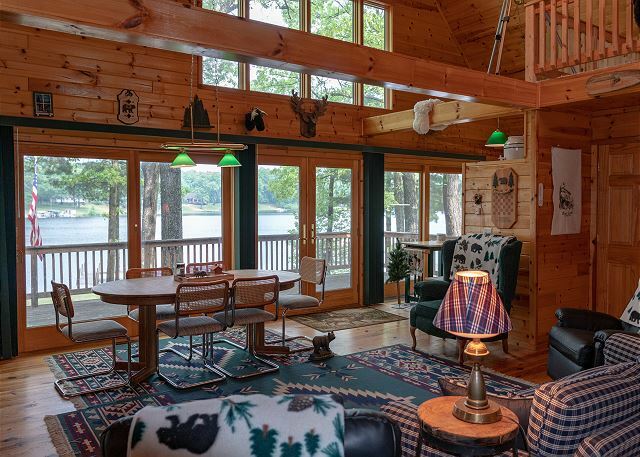 When you picture taking your family "Up North" for a vacation, chances are the image in your head looks a lot like what you'd find at this classic cottage on beautiful Long Lake in Walhalla, Michigan. The cottage itself has two levels, the main level and a loft area with plenty of sleeping. On the main floor you will find a open and bright living area, dining area, kitchen with all major appliances, two bedrooms and a full bath. 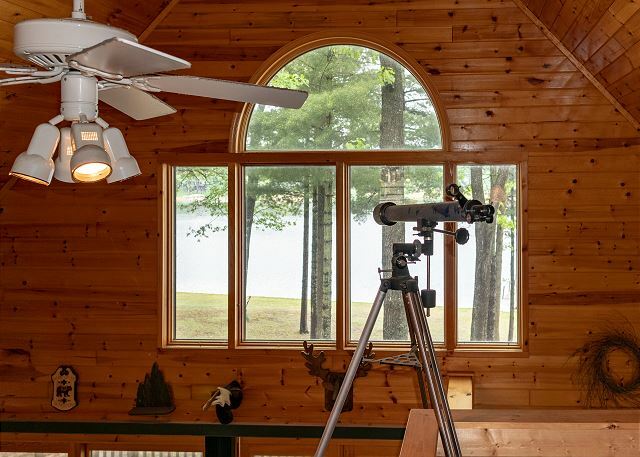 The loft area is open to the floor below and has 4 twin beds to along with great views of Long Lake. There is a huge wrap around deck with chairs to sit and relax on while you enjoy looking out to the dock and the water. 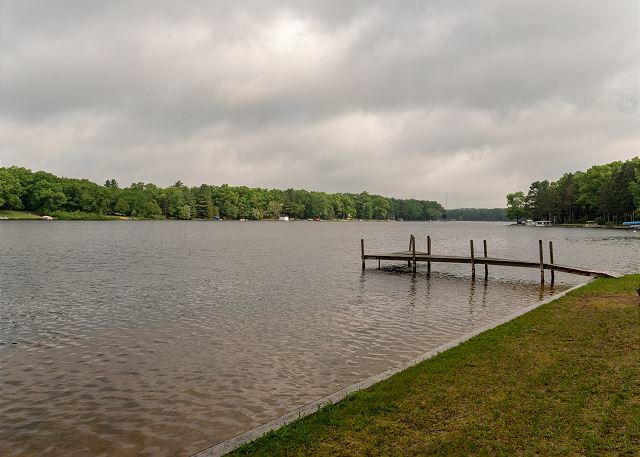 The back yard is a gently rolling hill towards the lake, with plenty of room to lay out or to play games along the shore of Long Lake. The private dock allows you to tie up your boat during your stay, or to get a running start for a big cannonball into the water! There is room to sleep 8 people, and there is room for 6 at the dining table. 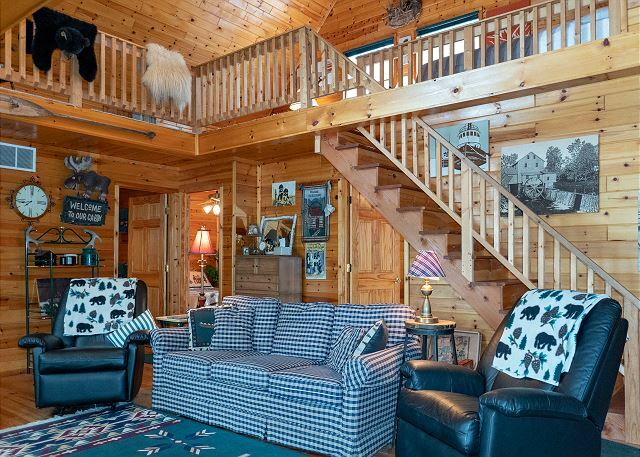 Please note that this cottage does not have televisions, cable, or internet service. Cancellations will be refunded if canceled 60 days or more prior to check-in. Any cancellations within 60 days of check-in will not be refunded. There are no refunds for early departures, reduction of nights rented, or delayed arrivals due to inclement weather or any other factor. Hi Chelsea - So happy to hear you had a great time at Long Lake! It is the quintessential Northern Michigan getaway! Thank you for choosing Unsalted Vacations, please come see us again soon. This place is amazing. 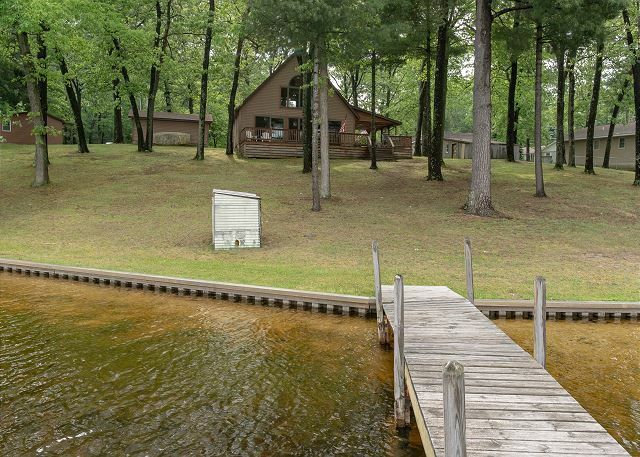 It's the perfect combination of lake access, a big cabin-esque house with full kitchen, and a big property with everything from fire pits to porches to grills to kayaks. It's also in a national forest, which was pretty. Thanks for the review Jonathan ! The Long Lake Cottage is a special place, so glad you got to spend time there and enjoyed yourselves. Come see us again!